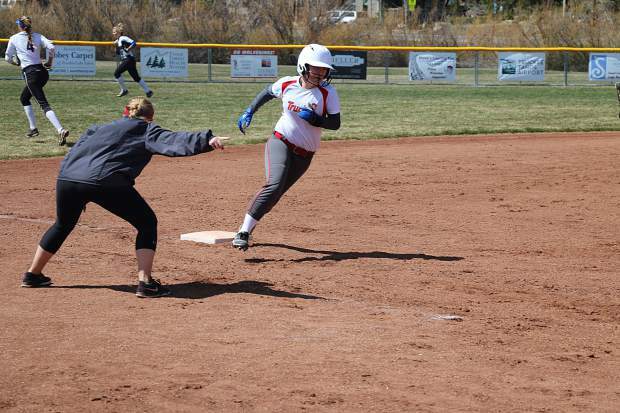 McKenna Purdy rounds third as Coach Ashely Post looks on during Saturday's win over South Tahoe. The Truckee Wolverines picked up their first victory of the season in a 20-17 victory over South Tahoe. After picking up their first win of the season, the Wolverines will travel to face a struggling Sparks team on Tuesday, April 17. 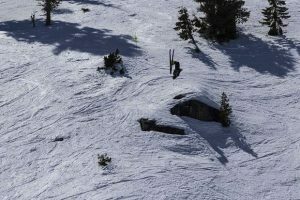 Miranda Parkhurst slides home safely during Truckee's first win of the season on Saturday, April 14. Stephanie Randall hits a double during the second game of a doubleheader on Saturday, April 14. 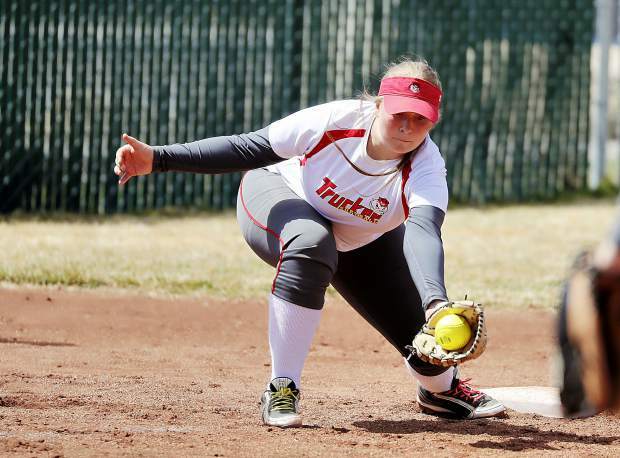 After nearly two weeks without a game, Truckee entered the win column for the fist time this season, but dropped their Class 3A Northern League series to South Tahoe. 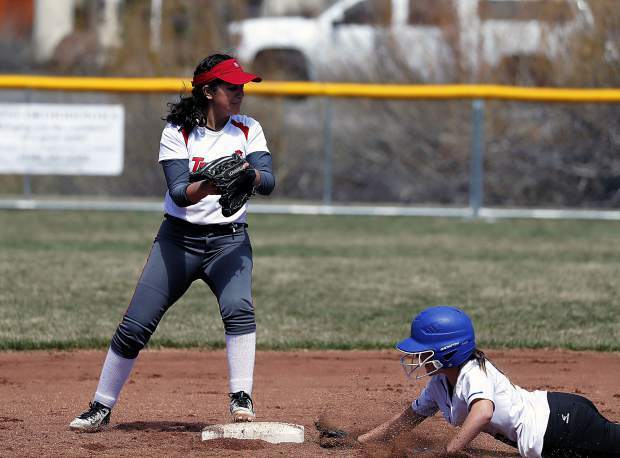 In Friday’s opener, Truckee’s defense seemingly failed to make it to the park. Senior pitchers Sierra Bohnet and Hannah Maciel had a hard time finding the plate, combining to walk eight and hit 11 Vikings batters. 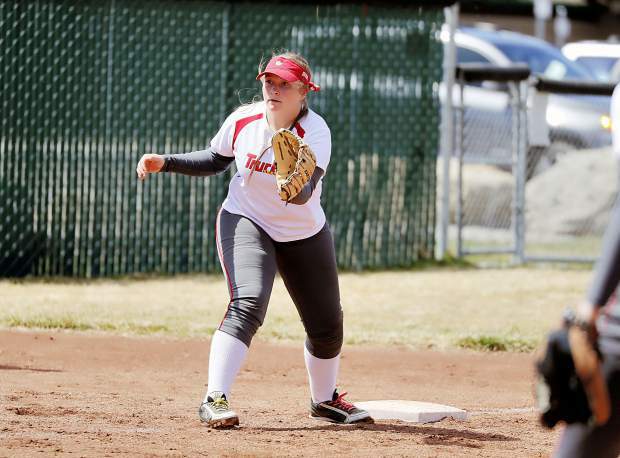 Wolverine fielders also made several errors early on, as Truckee went down 19-4 in a three-inning, mercy rule game, despite out hitting South Tahoe 6-5. Senior Stephanie Randall was 2 for 2 at the plate with a double and an RBI. Saturday morning started out in similarly, as the defense would commit two errors within the first three batters of the game, and finish with eight. 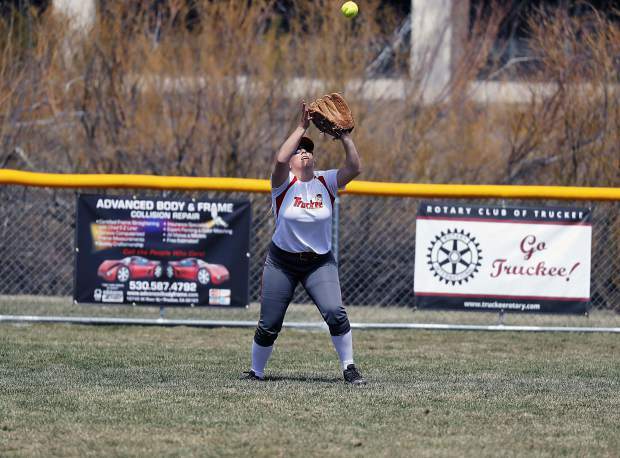 With only four practices outside the gym and on the dirt so far this season, Truckee is still catching up to the teams that have been practicing outdoors all year. Inside the circle, Maciel went the distance without hitting a batter, striking out three, while walking seven; a significant improvement from a day prior. While Truckee hitters struggled at the plate, Bohnet did pound out two hits, driving in one run. South Tahoe would 10-run the Wolverines after five innings by a score of 15-3. The finale would be a slugfest, with Truckee taking the 20-17 victory. 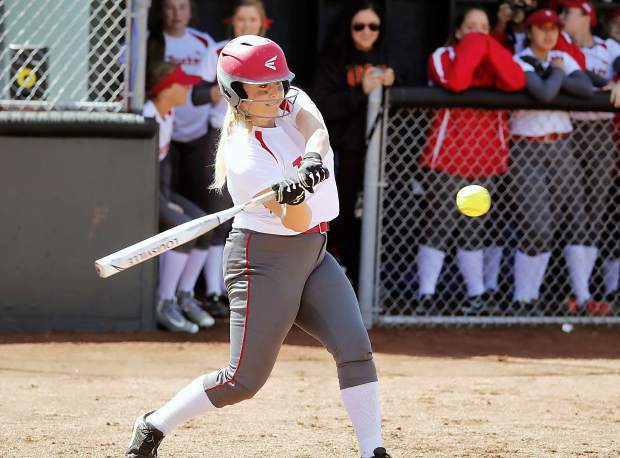 While the Vikings would take a two-run lead coming out of the top of the first, Truckee’s offense would explode by sending 13 hitters to the plate and scoring nine runs to finish off the bottom half. 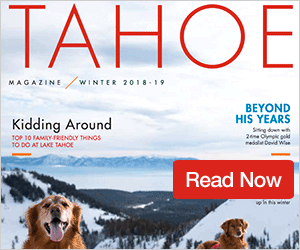 South Tahoe was undeterred and returned six runs in the second and five in the third, culminated by a grand slam by Hailey Naccarato. But the Wolverines were on their way up and clawed their way back to a 13-13 tie as they entered the bottom of the sixth. 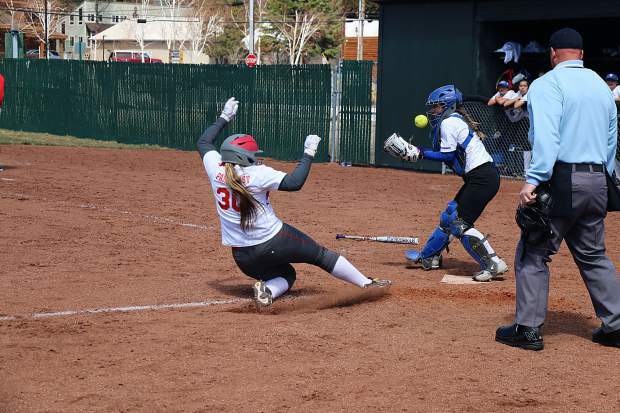 Needing to plate at least one run, Coach Ashley Pose called the suicide squeeze with the bases loaded, Bohnet on third, and sophomore McKenna Purdy at the plate. As the pitch was delivered, Bohnet committed to the plate and Purdy laid down a perfect bunt, as Truckee captured the lead. With the defense still unsure on the dirt, the ladies in red added six more insurance runs in the frame to take a 20-13 lead entering the top of the seventh. Like Maciel, Bohnet had rebounded with her pitching accuracy and was throwing well, but wearing down in the seventh. Up 20-15, Maciel would re-enter the circle and finish off the Vikings. 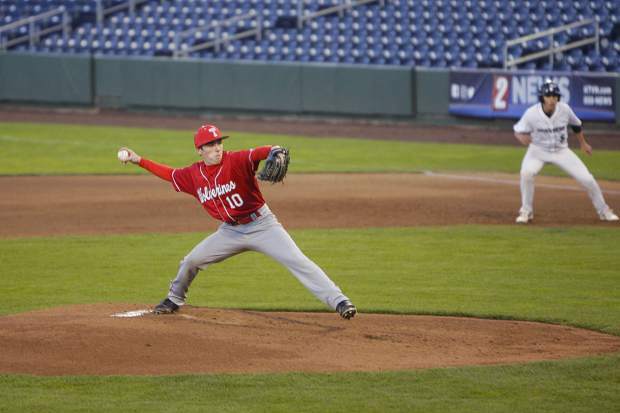 Bohnet threw 6 1/3 innings and finished with eight hits and eight strikeouts. Many of the strikeouts came by way of a devastating changeup she was dropping into the zone. 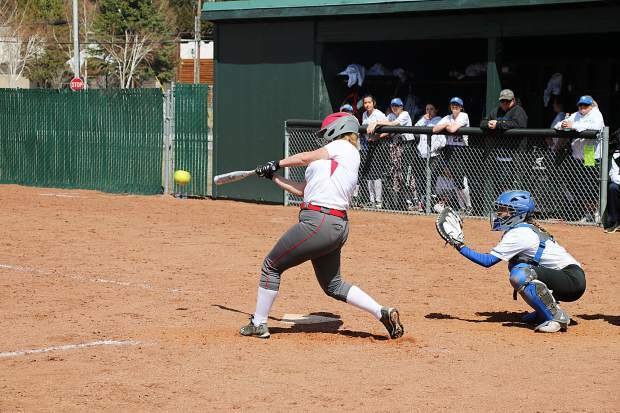 Offensively, Truckee was lead by junior Miranda Parkhurst who was 3 for 4 with a double and four RBIs. Senior Amelia Strusinski and Randall each had three hits, as Maciel, Purdy, Bohnet, and junior Casie Barnum each had two. 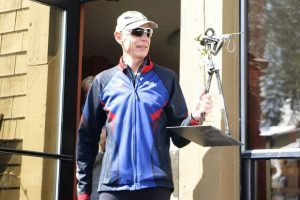 Truckee will next face Elko on Friday, April 20. The afternoon will get started with Senior Farewell at 2:30 p.m. and a game against the Indians at 3. The Wolverines will then play a doubleheader against Elko on Saturday at 11 a.m.